Is Southern Africa facing a food security disaster? Population growth, rising incomes and changing food preferences mean that agricultural demand in the region should increase by more than 80% – but regional agricultural production by only 35% – over the next 23 years. Without a significant push to increase agricultural production, the gap between domestic production and food demand is expected to be about 100 million metric tons by 2040 (see Figure 1) – and the region will have to rely even more on food imports to bridge the divide. 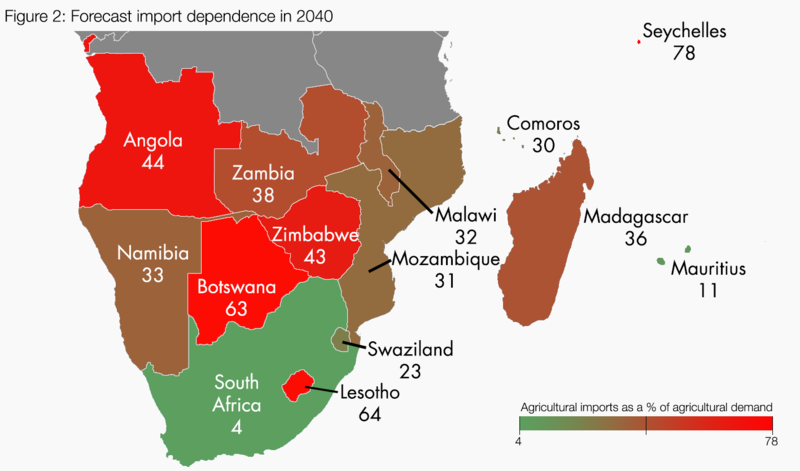 Southern Africa imports about 3.5% of its food, a figure that is expected to increase to nearly 29% by 2040. In other words, in two decades nearly a third of all food demand will be met through imports. By 2040, countries like Botswana, Lesotho and Seychelles are expected to import over 60% of total food demand (see Figure 2 below). 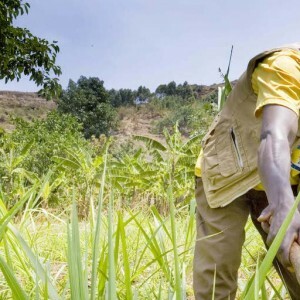 Only about 12.5% of the region’s arable land is under cultivation, and increasing the land under cultivation is a potential avenue for boosting production. But this strategy has its limits and can cause significant environmental degradation (via deforestation).